Residents of Vilappil gram panchayat in Kerala, who have been waging a battle against the adjacent Thiruvananthapuram Municipal Corporation over garbage dumping in their area, have once again succeeded in putting the authorities on their back foot. On August 3, residents of the panchayat prevented the district administration from moving machinery for leachate treatment into the corporation’s solid waste treatment plant located in the panchayat. The district administration had to withdraw the police force it had deployed at the site in the face of stiff resistance. The district administration had clamped prohibitory orders against public gatherings in Vilappil panchayat under Section 144 of the Criminal Procedure Code (CrPC). This was to enable the corporation to move the machinery to the waste treatment plant without any hindrance. Defying the orders, more than 5,000 villagers gathered and blockaded the road leading to the plant. Women and children took the front position. A large police force of about 2,500 personnel, including 500 women constables had been deployed to enforce law and order. When the truck with the machinery reached the panchayat, the police started arresting and removing the protesters. The agitators lit bonfires on the road to block the truck and the cops. To douse the fire, police used water cannons. The protesters hurled stones. 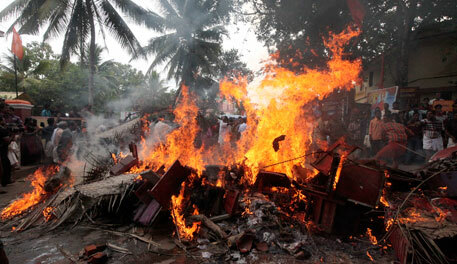 The battle continued for two hours, and finally the district administration was forced to withdraw the police force. In the melee, many people, including two women constables and a media person, sustained burns and injuries. The municipal corporation had the backing of the Kerala High Court. A division bench of the court, while considering a petition filed by the corporation, had issued direction to the state government on July 26, asking it to provide adequate police protection to the corporation’s trucks carrying machinery for the leachate treatment plant under construction in the solid waste treatment plant premise. The corporation's plant has remained shut for the past six months after the residents took a strong decision not to allow garbage trucks coming from the corporation into the area. The residents have been protesting against the plant for more than a decade, highlighting environmental pollution, water contamination and subsequent health problems. Last year, they intensified their agitation and started a relay hunger strike which is still on. It was when all the talks with the corporation authorities failed that the villagers decided to block the trucks. The Janakeeya Samara Samithi, the people's front which is spearheading the agitation, wants an immediate and permanent closure of the plant. The corporation’s stand is that this was not possible and would only lead to a garbage crisis in the state capital. The village council stood with the people and passed a resolution not to allow any more city waste into the village. In its petition to the high court, the corporation had alleged that the residents of Vilappil were not allowing it to even take equipment, clay for the landfill, and most importantly garbage, even when the corporation has a court order favouring it. In an earlier order of January 23, the division bench of the court had asked the corporation to take garbage to the plant with the help of the police. 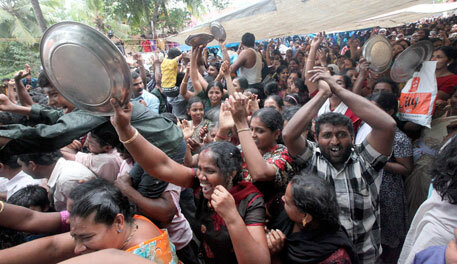 This culminated in brutal police action against the Vilappil people on February 13. 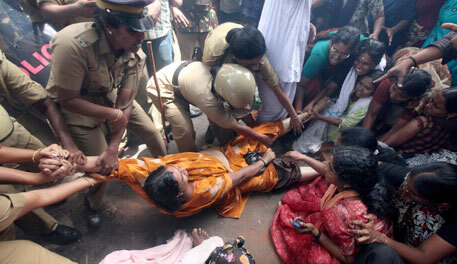 The protesters, including women and children, were beaten up ruthlessly. But in the end, the police and the garbage trucks had to retreat. The corporation once again approached the court, and the court strongly criticised the state police for their ineffective action and even suggested that the corporation should seek help from the Central Reserve Police Force (CRPF) for transporting garbage. Though the gram panchayat had approached the Supreme Court against the high court’s verdict, the apex court refused to quash the high court order. In an interim order issued on March 19, the Supreme Court said the corporation could take 90 tonnes of waste a day to the plant (Thiruvanthapuram generates about 200 tonnes of garbage a day) after getting the mandatory no-objection certificate (NOC) from the Kerala state pollution control board (KSPCB) and the license for operation of its plant from the panchayat. “We did our level best to implement the court order,” said additional district magistrate P K Girija while speaking to media persons after the incident. She led the operation. “We withdrew the force in the wake of the strong resistance from the people. We did not want to wage a war with the people,” she said. She also said the district administration will appraise the court about the situation in Vilappil. The village council and the people say the leachate treatment plant and scientific landfill should have been constructed when the plant started operation in 2000. After causing all the pollution and contamination of groundwater in the panchayat through years of waste dumping, the corporation woke up to the need for a leachate plant only when the village panchayat closed down the plant, they contend. "Once the leachate treatment plant is completed, the corporation would try to convince everyone that the factory does not pose any health hazard. We don't want to be in such a situation and hence no machinery will be allowed here," said S Sobhana Kumari, Vilappil panchayat president. The residents are determined not to allow any more garbage into the plant despite the court orders. “If God comes directly and asks us to allow the corporation to transport city waste to our village, we won’t heed it,” says Beneckson, one of the agitation leaders. The panchayat committee has decided to issue a reminder notice to the corporation regarding the licence of the plant. In May, the panchayat had issued a notice to the corporation according to which the corporation does not have the licence to run the plant. This means the panchayat holds the right to demand the shut down of any plant that functions without a valid licence. The state government has taken a convenient stand that it has no other option than obeying the court order and provide police protection to the corporation’s trucks and the plant. “ If we don’t obey the court order we’ll have to face contempt of court,” said Chief Minister Oommen Chandy, addressing media persons. At the same time, he says, people’s protests cannot be ignored.